The Thin Red Line is a 1998 Canadian-American epic war film written and directed by Terrence Malick. Based on the 1962 novel of the same name by James Jones, it tells a fictionalized version of the Battle of Mount Austen, which was part of the Guadalcanal Campaign in the Pacific Theater of World War II. It portrays soldiers of C Company, 1st Battalion, 27th Infantry Regiment, 25th Infantry Division, played by Sean Penn, Jim Caviezel, Nick Nolte, Elias Koteas and Ben Chaplin. The film's title comes from the novel, which alludes to a line from Rudyard Kipling's poem "Tommy", from Barrack-Room Ballads, in which he calls foot soldiers "the thin red line of heroes", referring to the stand of the 93rd Regiment in the Battle of Balaclava of the Crimean War. The film marked Malick's return to filmmaking after a 20-year absence. It co-stars Nick Nolte, Adrien Brody, George Clooney, John Cusack, Woody Harrelson, Elias Koteas, Jared Leto, John C. Reilly and John Travolta. Reportedly, the first assembled cut took seven months to edit and ran five hours. By the final cut, footage of performances by Bill Pullman, Lukas Haas, and Mickey Rourke had been removed (one of Rourke's scenes was included in the special features outtakes of the Criterion Blu-ray and DVD release). The film was scored by Hans Zimmer and shot by John Toll. Principal photography took place in the Australian state of Queensland and in the Solomon Islands. The film grossed $98 million against its $52 million budget. Critical response was generally positive and the film was nominated for seven Academy Awards: Best Picture, Best Director, Best Screenplay Based on Material Previously Produced or Published, Best Cinematography, Best Film Editing, Best Original Dramatic Score and Best Sound. It won the Golden Bear at the 1999 Berlin International Film Festival. Martin Scorsese ranked it as his second-favorite film of the 1990s. On At the Movies, Gene Siskel called it "the greatest contemporary war film I've seen". A previous film adaptation of the novel was released in 1964. United States Army Private Witt goes AWOL from his unit and lives among the carefree Melanesian natives in the South Pacific. He is found and imprisoned on a troop carrier by First Sergeant Welsh of his company. The men of C Company, 1st Battalion, 27th Infantry Regiment, 25th Infantry Division have been brought to Guadalcanal as reinforcements in the campaign to secure Henderson Field and seize the island from the Japanese. As they wait in a Navy transport, they contemplate their lives and the invasion. Battalion commander Lieutenant Colonel Tall talks with Brigadier General Quintard about the invasion and its importance. C Company lands on Guadalcanal unopposed and marches to the interior of the island, encountering natives and evidence of the Japanese presence. They arrive near Hill 210, a key Japanese position. The Japanese have placed bunkers at the top of the hill and anyone attempting the climb will be cut down. A brief shelling of the hill begins the next day at dawn. C Company attempts to capture the hill but is repelled by gunfire. Among the first killed is one of the platoon leaders, Second Lieutenant Whyte. Later in the battle, having advanced further up the hill, a squad led by Sergeant Keck hides behind a knoll safe from enemy fire to wait for reinforcements. Keck reaches for a grenade on his belt and accidentally pulls the pin, then throws himself back so that he will be the only one to die. Lieutenant Colonel Tall orders the company commander, Captain James Staros, to take the bunker by frontal assault, at whatever cost. Staros refuses and Tall decides to join Staros on the front line to see the situation. The Japanese resistance seems to have lessened, and Tall's opinion of Staros seems to have been sealed. Private Witt, having been assigned punitively as a stretcher bearer, asks to rejoin the company, and is allowed to do so. A small detachment of men performs a reconnaissance mission on Tall's orders to determine the strength of the Japanese bunker. Private Bell reports there are five machine guns in the bunker. He joins another small team of men (including Witt), led by Captain John Gaff, on a flanking mission to take the bunker. The operation is a success and C Company overruns one of the last Japanese strongholds on the island. The Japanese they find are largely malnourished and dying, and put up little resistance. For their efforts, the men are given a week's leave, though they find little joy in the respite in the fighting: the airfield where they are based comes under enemy artillery bombardment; Captain Staros is relieved of his command by Lieutenant Colonel Tall, who deems him too soft for the pressures of combat and suggests that he apply for reassignment and become a lawyer in the JAG in Washington. He offers to arrange a Silver Star for Staros, to avoid the unit's name being stained by having an officer removed from command. Bell receives a letter from his wife informing him that she has fallen in love with someone else and wishes to divorce. Witt comes across the locals and notices that they have grown distant and distrustful of him and quarrel regularly with one another. The company is sent on patrol up a river but with the inexperienced 1st Lieutenant George Band at its head. As Japanese artillery fire falls close to their positions; Band orders some men to scout upriver, with Witt volunteering to go along. They encounter an advancing Japanese column and are attacked. To buy time for Corporal Fife to go back and inform the rest of the unit, Witt draws away the Japanese but is then encircled by one of their squads, who demand that he surrender. He raises his rifle and is gunned down. The company is able to retreat safely, and Witt is later buried by Welsh and his squadmates. C Company receives a new commander, Captain Bosche and boards a waiting LCT, departing from the island. Beyond these numerous top-billed cast, the ensemble included appearances in smaller roles by many other well-known actors, including Kirk Acevedo, Penny Allen, Mark Boone Junior, Matt Doran, Don Harvey, Danny Hoch, Thomas Jane, Miranda Otto and Nick Stahl. New York-based producer Bobby Geisler first approached Malick in 1978 and asked him to direct a film adaptation of David Rabe's play In the Boom Boom Room. Malick declined the offer, but instead discussed the idea of a film about the life of Joseph Merrick. Once word got out about David Lynch's film of The Elephant Man, he shelved the idea. In 1988, Geisler and John Roberdeau met with Malick in Paris about writing and directing a movie based on D. M. Thomas' 1981 novel The White Hotel. Malick declined, but told them that he would be willing instead to write either an adaptation of Molière's Tartuffe, or of James Jones' The Thin Red Line. The producers chose the latter and paid Malick $250,000 to write a screenplay. Malick began adapting The Thin Red Line on January 1, 1989. Five months later, the producers received his first draft, which was 300 pages long. According to an article in Entertainment Weekly, they gained the director's confidence by "catering to his every whim," providing him with obscure research material, including a book titled Reptiles and Amphibians of Australia, an audiotape of Kodo: Heartbeat Drummers of Japan, information on the Navajo code talkers recruited by the United States Marine Corps to communicate in their native Navajo language to evade understanding by Japanese troops intercepting radio transmissions, making his travel plans, and helping the director and his wife Michele get a mortgage for their Paris apartment. "Malick's Guadalcanal would be a Paradise Lost, an Eden, raped by the green poison, as Terry used to call it, of war. Much of the violence was to be portrayed indirectly. A soldier is shot, but rather than showing a Spielbergian bloody face we see a tree explode, the shredded vegetation, and a gorgeous bird with a broken wing flying out of a tree". Malick spent years working on other projects, including a stage production of Sansho the Bailiff and a script known as The English-Speaker, spending $2 million of the producers' money, half of which for writing. In 1990, he met with James Jones' widow Gloria and his daughter Kaylie about adapting The Thin Red Line into a film. By January 1995, Geisler and Roberdeau were broke and pressured Malick to decide which one he would complete. They approached Malick's former agent, Mike Medavoy, who was setting up his own production company, Phoenix Pictures, and he agreed to give them $100,000 to start work on The Thin Red Line. Medavoy had a deal with Sony Pictures and Malick began scouting locations in Panama and Costa Rica before settling on the rain forests of northern Australia. In April 1997, three months before filming, Sony pulled the plug while crews were building the sets in Queensland, because new studio chairman John Calley did not think Malick could make his movie with the proposed $52 million budget. Malick traveled to Los Angeles with Medavoy to pitch the project to various studios. 20th Century Fox agreed to put up $39 million of the budget with the stipulation that Malick cast five movie stars from a list of 10 who were interested. Pioneer Films, a Japanese company, contributed $8 million to the budget, and Phoenix added $3 million. Casting for the film became a hot topic. When Sean Penn met Malick, he told him, "Give me a dollar and tell me where to show up". Scripts were also sent to Robert De Niro, Robert Duvall and Tom Cruise. In 1995, once word went out that Malick was making another movie after many years, numerous actors approached him, flooding the casting directors until they had to announce they wouldn't be accepting more requests. Some A-list actors including Brad Pitt, Al Pacino, Gary Oldman, and George Clooney offered to work for a fraction and some even offered to work for free. Bruce Willis even went as far as offering to pay for first-class tickets for the casting crew, to get a few lines for the movie. At Medavoy's home in 1995, Malick staged a reading with Martin Sheen delivering the screen directions, and Kevin Costner, Will Patton, Peter Berg, Lukas Haas, and Dermot Mulroney playing the main roles. In June of that year, a five-day workshop was scheduled at Medavoy's with Pitt dropping by, and culminating with Malick putting on the soundtrack of Where Eagles Dare and playing Japanese taiko drums. Malick met with an interested Johnny Depp about the project at the Book Soup Bistro on the Sunset Strip. Edward Norton flew out to Austin and met Malick, who had been impressed by the actor's screen test for Primal Fear. Matthew McConaughey reportedly took a day off filming A Time to Kill to see Malick. Others followed, including William Baldwin, Edward Burns, Josh Hartnett, Philip Seymour Hoffman, Stephen Dorff, and Leonardo DiCaprio; the latter flew up from the Mexico set of Romeo + Juliet to meet Malick at the American Airlines lounge in the Austin airport. Before the casting was finalized, Nicolas Cage had lunch with Malick in Hollywood in February 1996. Malick went off to scout locations and tried calling Cage that summer only to find out that his phone number had been disconnected. Tom Sizemore, however, was offered a more substantial role in Saving Private Ryan and, when he could not contact Malick for several days, decided to do Steven Spielberg's film instead. Actors Bill Pullman, Mickey Rourke, and Lukas Haas filmed scenes for the movie but were cut from the final film due to time constraints. Publicity stills of Pullman (as Sgt. MacTae, in a scene opposite Brody and Chaplin) can be seen online, Haas is pictured in the booklet of the CD soundtrack, and one of Rourke's scenes was restored for the Criterion Blu-Ray/DVD release of the film. James Caviezel, who was cast as Private Witt, credits Malick's casting of him as the turning point in his career. Cinematographer John Toll began talking to Malick in August 1996 several times over the phone about the film. Toll met Malick in September of the same year and was asked to do the film in the beginning of 1997. Malick and Toll began location scouting in February 1997 and started principal photography in June of that year. Pre-production went slowly. Weeks before filming began, Malick told Geisler and Roberdeau not to show up in Australia where the film was being made, ostensibly because George Stevens Jr. would be the on-location producer supporting line producer Grant Hill. Malick told them that they had upset the studio for refusing to give up above-the-title production credit to Stevens. He did not tell them, however, that in 1996 he had a clause inserted in his contract barring the producers from the set. Geisler and Roberdeau were mystified about this behavior; Geisler told Entertainment Weekly, "I didn't think he was capable of betrayal of this magnitude". Malick and Toll shot for 100 days in Australia using Panavision cameras and lenses, 24 days in the Solomon Islands and three days in the United States. They scouted the historic battlefields on Guadalcanal and shot footage, but health concerns over malaria limited filming to daylight hours only. Logistics were also difficult to shoot the entire film there: As director of photography John Toll put it, "It's still a bit difficult to get on and off the island, and we had some scenes that involved 200 or 300 extras. We would have had to bring everybody to Guadalcanal, and financially it just didn't make sense". The Thin Red Line was filmed predominantly in the Daintree Rainforest and on Bramston Beach, both in north Queensland, Australia. Filming also took place on Dancer Mountain, which had such rough terrain that trailers and production trucks could not make it up the hill. A base camp was set up and roads carved out of the mountain. Transporting 250 actors and 200 crew members up the hill took two hours. Filming took place in the Pacific Ocean off the coast of Southern California near Santa Catalina Island. Malick's unconventional filming techniques included shooting part of a scene during a bright, sunny morning only to finish it weeks later at sunset. He made a habit of pointing the camera away during an action sequence and focus on a parrot, a tree branch or other fauna. Malick's reputation and working methods commanded great respect among the actors, with both Woody Harrelson and John Savage staying on for an extra month after they finished all of their scenes just to watch him at work. Bill Pullman, Lukas Haas and Mickey Rourke performed but their scenes were eventually cut. Billy Bob Thornton recorded narration that was scrapped. Martin Sheen and Viggo Mortensen participated in readthroughs of the script and are thanked in the end credits. Editor Leslie Jones was on location for five months and rarely saw Malick, who left her to her own devices. After principal photography wrapped, she came back with a five-hour first cut and spent seven months editing, with Thornton contributing three hours of narrative voice-over material. It was at this point that editor Billy Weber joined and they spent 13 months in post-production and the last four months mixing the film, using four Avid machines with a fifth added at one point. Malick edited the footage one reel at a time with the sound off while listening to a Green Day CD. There were no preview screenings but several in-house ones, the largest of which was attended by 15 people for marketing executives. The editors faced the challenge of blending footage of veteran actors with less-experienced ones, integrating the many cameos, and the voice-overs. According to Jones, "Malick removed scenes with dialogue whenever possible, with the final film varying greatly from the original concept". Four months after principal photography, Malick invited Toll to a rough-cut screening of the film. In December 1998, Toll did the first color correction at the lab prior to the film's release in North America. I was so focused and professional, I gave everything to it, and then to not receive everything ... in terms of witnessing my own work. It was extremely unpleasant because I'd already begun the press for a film that I wasn't really in. Terry obviously changed the entire concept of the film. I had never experienced anything like that... You know the expression 'Don't believe the hype'? Well, you shouldn't. Malick was upset that the studio screened his unfinished version for critics and Penn ended up helping him in the editing room, shaping the final version. Malick spent three more months and cut 45 additional minutes from the film. The director refused to subject his film to test screenings before delivering his final cut. After Geisler and Roberdeau told their story to Vanity Fair magazine, Medavoy's attorneys declared them in breach of contract and threatened to remove their names from the film unless they agreed to do no future interviews until after the Academy Awards. The film score was composed by Hans Zimmer, with additional music from John Powell. The album was nominated for Best Dramatic Score at the 71st Academy Awards. It was Hans Zimmer's fifth Oscar nomination as a composer, but he lost out to Roberto Benigni's Life is Beautiful (music by Nicola Piovani). The album was released by RCA Victor and conducted by Gavin Greenaway. Among the music not written by Zimmer which appears in the film is In Paradisum from Requiem by Gabriel Fauré and the opening minutes of The Unanswered Question by Charles Ives. Zimmer wrote several hours of music, and an abundance of different themes, before Malick started to shoot the film. The director played the music on the set, while filming, to get himself, and the rest of the crew and actors in the right frame of mind. The official soundtrack features tracks that were not used on the film and some tracks from the film are not found on the CD. The film features several pieces of Melanesian choral music sung by the Choir of All Saints in Honiara and the Melanesian Brotherhood in Tabalia, only one of which is featured on the soundtrack. However, another soundtrack was released containing several tracks from the choirs (included Jisas Yu Holem Hand Blong Mi, heard in the movie and used for the trailer), which has since gone out of circulation.. The Thin Red Line was given a limited release on December 25, 1998, in five theaters where it grossed $282,534 on its opening weekend. The film was given a wide release on January 15, 1999, in 1,528 theaters where it grossed $9.7 million during its opening weekend. The film earned $98,126,565 at the worldwide box office. On review aggregator website Rotten Tomatoes, the film holds an approval rating of 80%, based on 94 reviews, and an average rating of 7.2/10. The website's critical consensus reads, "The Thin Red Line is a daringly philosophical World War II film with an enormous cast of eager stars." On Metacritic, the film has a weighted average score of 78 out of 100, based on 32 critics, indicating "generally favorable reviews". Gene Siskel described it as the "finest contemporary war film I've seen, supplanting Steven Spielberg's Saving Private Ryan from earlier this year, or even Oliver Stone's Platoon from 1986." A more subdued Roger Ebert gave it three stars, saying that it felt confused and unfinished. He wrote, "The movie's schizophrenia keeps it from greatness (this film has no firm idea of what it is about), but doesn't make it bad. It is, in fact, sort of fascinating... The battle scenes themselves are masterful, in creating a sense of the geography of a particular hill, the way it is defended by Japanese bunkers, the ways in which the American soldiers attempt to take it ... Actors like Sean Penn, John Cusack, Jim Caviezel and Ben Chaplin find the perfect tone for scenes of a few seconds or a minute, and then are dropped before a rhythm can be established". In his review for Time, Richard Corliss wrote, "Some films deal in plot truth; this one expresses emotional truth, the heart's search for saving wisdom, in some of the most luscious imagery since Malick's last film, the 1978 Days of Heaven". Mike Clark of USA Today gave the film four out of four stars. Writing in the Washington Post, Michael O'Sullivan wrote, "The Thin Red Line is a movie about creation growing out of destruction, about love where you'd least expect to find it and about angels – especially the fallen kind – who just happen to be men". Andrew Johnston of Time Out New York wrote: "Like Malick's previous efforts - Badlands (1973) and Days of Heaven (1978) - Line is a film of incredible beauty. However, the atmosphere created by John Toll's breathtaking cinematography and Hans Zimmer's powerful score is occasionally compromised. The parade of cameos (John Travolta, George Clooney, Woody Harrelson and John Cusack briefly appear) is somewhat distracting, and the fact that Bell and Witt both have Appalachian accents sometimes makes the characters hard to differentiate. Yet, even though it's confusing at times (and perhaps a little long), Line is still a film of rare substance and power." Owen Gleiberman gave the film a "B-" in his review for Entertainment Weekly and wrote, "The Thin Red Line could, I think, turn out to be this season's Beloved, a movie too paralyzingly high-minded to connect with audiences". In her review for The New York Times, Janet Maslin wrote, "The heart-piercing moments that punctuate its rambling are glimpses of what a tighter film might have been". 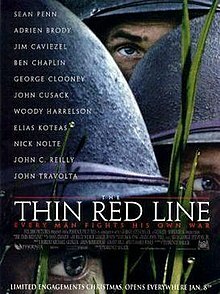 In a special episode of Siskel and Ebert, guest host Martin Scorsese selected The Thin Red Line as the second best film of the 1990s behind The Horse Thief. The Thin Red Line was nominated for 7 Academy Awards for Best Cinematography, Best Director, Best Film Editing, Best Original Score, Best Picture, Best Sound and Best Adapted Screenplay. It failed to win any of these awards. However, the film was awarded the Golden Bear for Best Film at the 49th Berlin International Film Festival in 1999. The Thin Red Line was named Best Cinematography for 1998 by the National Society of Film Critics in 1998. Time magazine ranked Malick's film #6 on their Best of 1998 Cinema list. Jonathan Rosenbaum, film critic for the Chicago Reader, ranked Malick's film as his second favorite film of 1999. On September 28, 2010, The Criterion Collection released a special edition of The Thin Red Line on DVD and Blu-ray with a new, restored 4K digital transfer, supervised and approved by Terrence Malick and cinematographer John Toll. The release was met with positive reviews. ^ "The Thin Red Line (15]". British Board of Film Classification. January 29, 1999. Retrieved October 11, 2016. ^ " Rudyard Kipling -- Tommy. Web Books. Retrieved 2001-08-04. ^ a b c d e f g h Biskind, Peter (August 1999). "The Runaway Genius". Vanity Fair. Retrieved April 22, 2010. ^ a b c d e f Young, Josh (January 15, 1999). "Days of Hell". Entertainment Weekly. ^ a b c Abramowitz, Rachel (March 1999). "Straight Out the Jungle". The Face. ^ a b c Puig, Claudia (January 7, 1999). "The Magic of Malick". USA Today. ^ a b c d Docherty, Cameron (June 7, 1998). "Maverick Back from the Badlands". Sunday Times. ^ "The Thin Red Line DVD: First Look at Mickey Rourke & 8 Other Outtakes from Terrence Malick's War Film". Retrieved May 22, 2011. ^ Atkinson, Michael (November 2001). "James Caviezel: why Hollywood learned to pronounce his name in a hurry". Interview. Archived from the original on June 13, 2006. Retrieved May 11, 2007. ^ a b c d e Bourton, Tom (May 2000). "The Art of War". Home Cinema Choice. Archived from the original on September 28, 2007. Retrieved November 27, 2007. ^ Pizzello, Stephen (February 1999). "The War Within". American Cinematographer. Retrieved January 7, 2008. ^ Handy, Bruce; Port Douglas (October 13, 1997). "His Own Sweet Time". Time. Retrieved November 11, 2008. ^ Kiang, Jessica (April 10, 2013). "10 Actors Cut From Terrence Malick Films & How They Reacted". ^ a b c d e Torgerson, Liv (May – June 1999). "Conversations With ... Billy Weber and Leslie Jones". Motion Picture Editors Guild Newsletter. 20 (3). Archived from the original on August 29, 2008. Retrieved November 27, 2007. ^ Winter, Jessica. "Absence of Malick". slate.com. Slate. Retrieved March 25, 2016. ^ Mottram, James (April 21, 2001). "The Prime of Mr. Adrien Brody". The Independent. ^ The Thin Red Shrine. Eskimo.com. Retrieved 2011-01-05. ^ Portman, Jamie (January 2, 1999). "Elusive Director Surfaces with Thin Red Line". Montreal Gazette. ^ Soundtrack Reviews. Scorereviews.com (2010-11-23). Retrieved 2011-01-05. ^ Chants from the Thin Red Line: Melanesian Choirs: The Blessed Islands: Music. Amazon.com. Retrieved 2011-01-05. ^ "The Thin Red Line". Box Office Mojo. October 19, 2007. Retrieved October 19, 2007. ^ "The Thin Red Line (1998)". Rotten Tomatoes. Fandango Media. Retrieved April 10, 2018. ^ "The Thin Red Line Reviews". Metacritic. CBS Interactive. Retrieved April 10, 2018. ^ Siskel, Gene. "The Thin Red Line". Siskel & Ebert. ^ Ebert, Roger (January 8, 1999). "The Thin Red Line". Chicago Sun-Times. Retrieved October 19, 2007. ^ Corliss, Richard (December 28, 1998). "Ho, Ho (Well, No)". Time. Retrieved November 11, 2007. ^ Clark, Mike (December 23, 1998). "Stirring Red Line Captures War's Humanity and Horror". USA Today. ^ O'Sullivan, Michael (January 8, 1999). "Red Line: Above and Beyond". Washington Post. ^ Time Out New York, December 17–31, 1998, p. 141. ^ Gleiberman, Owen (December 23, 1998). "The Thin Red Line". Entertainment Weekly. Retrieved November 27, 2007. ^ Maslin, Janet (December 23, 1998). "Beauty and Destruction in Pacific Battle". The New York Times. Retrieved January 7, 2008. ^ Ebert, Roger (February 23, 2000). "The Best 10 Movies of the 1990s". Chicago Sun Times. ^ Ebert, Roger (February 26, 2000). "Ebert & Scorsese: Best Films of the 1990s". Chicago Sun Times. ^ "The Thin Red Line". Variety. Archived from the original on November 28, 2007. Retrieved January 10, 2008. ^ "The Thin Red Line". Berlin International Film Festival. 1999. Retrieved January 7, 2008. ^ Carr, Jay (January 4, 1999). "National Film Critics Tap Out of Sight". Boston Globe. ^ "The Best of 1998 Cinema". Time. December 21, 1998. Retrieved November 11, 2008. ^ Rosenbaum, Jonathan (2000). "Hope Springs Eternal". Chicago Reader. Retrieved November 27, 2007. ^ a b c d e f g "Academy Award Nominations list for the 1990s". Archived from the original on November 2, 2013. Retrieved December 1, 2010. ^ Kirk Acevedo Biography – Yahoo! Movies. Movies.yahoo.com (1974-11-27). Retrieved 2011-01-05. ^ "ACE Eddie preview". Retrieved December 1, 2010. ^ The ASC Archived September 3, 2011, at the Wayback Machine. The ASC (2010-06-29). Retrieved 2011-01-05. ^ "AFI awards 2009". Retrieved December 1, 2010. ^ Australian Screen Sound Guild – Filmes – Alugar. Cineteka.com. Retrieved 2011-01-05. ^ CNN – Broadcast Film critics name 'Saving Private Ryan' best film – January 26, 1999. Edition.cnn.com (1999-01-26). Retrieved 2011-01-05. ^ DGA Archived November 20, 2008, at the Wayback Machine. DGA. Retrieved 2011-01-05. ^ The Thin Red Line – Cast, Crew, Director and Awards – NYTimes.com. Movies.nytimes.com (2010-10-13). Retrieved 2011-01-05. ^ a b c Nick's Flick Picks review of The Thin Red Line. Nicksflickpicks.com. Retrieved 2011-01-05. ^ "Political Film Society award list". Retrieved December 1, 2010. ^ a b c d e f g "Press Academy awards list". Archived from the original on December 3, 2007. Retrieved December 1, 2010. ^ "The Thin Red Line". The Criterion Collection. Retrieved July 29, 2010. ^ Humanick, Rob (September 28, 2010). "The Thin Red Line - DVD Review". Slant Magazine. Retrieved November 7, 2015. ^ "The Thin Red Line Blu-ray". Blu-ray.com. September 28, 2010. Retrieved November 8, 2015. Critchley, Simon (December 2002). "Calm: On Terrence Malick's The Thin Red Line". Film Philosophy. 6 (38). Retrieved November 8, 2015. Biggar, Nigel (June 4, 2013). "The Horror or the Glory? : Terence Malick's 'The Thin Red line'". Retrieved November 8, 2015. Audio recording of a sermon by the Rev'd Canon Nigel Biggar (Religious Professor of Moral and Pastoral Theology, Oxford University).